Over the course of a long and distinguished career, actor Patrick Stewart has worked diligently to create a reputation as a serious professional - a man who approaches his craft with commitment and class. He is best known for two genre-specific roles. Star Trek fans identify him as Captain Jean-Luc Picard, the man who helmed the U.S.S. Enterprise through seven seasons of Star Trek: The Next Generation on TV and four subsequent films. For superhero lovers, he is Professor Charles Xavier, a role he has returned to on-and-off during the past 16 years. In bringing Stewart on board for his indie thriller Green Room, director Jeremy Saulnier has scored a masterful coup of against-type casting. In this movie, the golden-tongued, mild-mannered Shakespearean actor plays a villain so callous as to be frightening and does it with a degree of understatement that makes the character all the more chilling. Most of Green Room transpires in a single room where the protagonists become trapped after suffering the misfortune of being in the clichéd wrong place at the wrong time. The four members of a punk rock band - Pat (Anton Yelchin), Sam (Alia Shawkat), Reece (Joe Cole), and Tiger (Callum Turner) - wish this was one gig they had passed up. In a forgotten corner of the Pacific Northwest populated by rednecks and neo-Nazis, they play their set, collect their $300, and are about to leave when happenstance makes them witnesses to a murder. The men running the club aren’t anxious to have them talking to the police and, when the owner, Darcy Banker (Stewart), arrives, he decides that the only way to clean things up is to eliminate the witnesses. This sets up a confrontation pitting the rockers and a bystander, Amber (Imogen Poots), against Darcy and his ruthless band of thugs. Fortunately for the outgunned victims, their would-be killers are match viciousness with ineptitude. Although some of the tension in Green Room results from the clash between the two sides (which is played out as a contest of wit and wills punctuated by instances of bloody violence), the claustrophobic manner in which Saulnier (in collaboration with cinematographer Sean Porter) shoots the conflict amps it up. The film’s framing is designed to make the viewer uncomfortable. The “green room” feels close and cramped and is surrounded by an imposing forest wreathed in the darkness of night. Stewart’s dispassionate voice is more effective at generating dread than any over-the-top, histrionic villain could be. Green Room has been called out by some for its violence but, in the pantheon of R-rated thrillers of its ilk, its level of gore isn’t extreme. Some of the most gruesome moments occur in near-darkness, sparing the audience a graphic depiction of events. A dog mauling might have been considered shocking if not for the more visceral animal-on-human encounter presented in The Revenant. 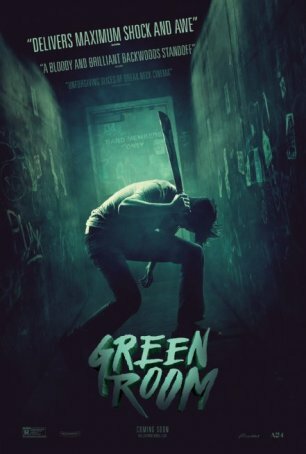 That’s not to say Green Room is tame or appealing to those with a distaste for violent fare, but it’s no more extreme than dozens of similar motion pictures. Identifying Green Room’s audience is a simple matter. The movie is for anyone who enjoys sitting through 90 tense minutes and feeling the attendant adrenaline rush. It’s like a well-constructed horror movie although there’s nothing supernatural happening here and the only monsters are of the human variety. As intimate as it is unnerving, this production will delight those who enjoy this kind of experience.